We’ve taken a brief look at the wild monks who split off from established Buddhist orthodoxy and trained in the fighting arts, and we also explored how fighting monks developed bare-handed combat techniques to complement the staff work. Now we’ll explore the fusion of Chinese cosmology, Taoist rites with the Buddhist fighting techniques to create the traditional martial arts we recognize today. 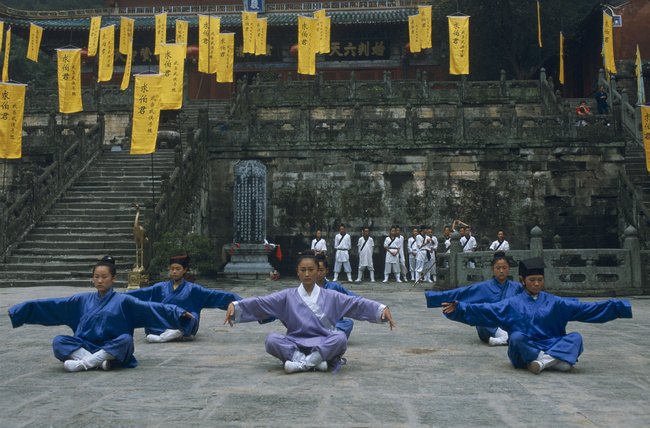 Taiji Quan, Bagua, Shaolin, Xingyi Quan and Plum Blossom Fist all evolved out of religious movements. Taiji means literally “the supreme ultimate” and is derived from the Yijing, the Book of Changes, a metaphysical collection of essays and poems used to tell fortunes and divine the true essence of things. Bagua refers to the “eight trigrams,” another cosmological idea found in the Yijing; Xingyi means “mind and intent”; and the Plum Blossom Fist arose out of sectarian rebellions along the Yellow River basin in the 16th and 17th centuries. Fusing cosmology and Taoist ideas with martial arts seems to have been as natural a transition as it was for wilder monks to take up fighting, or staff-wielding clerics to move toward strikes and kicks. It still took 300 years though, before the Chinese martial arts became inextricably entwined with ideas of invulnerability, spiritual self-cultivation, and immortality. The oldest text we have that describes in detail the relationship between hand combat in the martial arts and Chinese religious beliefs is the Sinews Transformation Classic (1624). Later texts elaborate on the idea, and 19th and 20th century fiction stories take it for granted, but this text is the first to make the link. The link is actually a synthesis of three major ideas: martial excellence, medicinal practices, and religious transcendence, described using Taoist vocabulary. Taoism is China’s indigenous religion and it goes back centuries, to the very dawn of Chinese civilization. Taoist priests were obsessed with immortality. Unlike Western priests however, the Chinese Taoists didn’t differentiate between a soul and a body. For Taoists, the only way to maintain one’s identity and cross death’s threshold was to cultivate the body and the spirit together. In Taoist beliefs, there is no special afterlife for souls only. So, the priests developed a set of gymnastics and breathing techniques, called daoyin, which they believed could help keep disease away, invigorate the body, and if done in combination with specific medicinal, sexual, and ceremonial practices, would lead to immortality. They didn’t just develop breathing techniques and gymnastics: there is also a lot of evidence linking Taoist rites of immortality with swordsmanship and the crafting of divine swords. The Taoist fascination with swords goes back to the very beginning, before Shaolin was even a twinkle in Boddhidharma’s eye, and in China the Taoist with his sword is as emblematic as the Buddhist with his staff. It’s possible that the fusion of martial arts with Taoist traditions does indeed go back to the mythical days when men wrestled animals and priests wielded magical dragon-forged blades, but as far as we can tell right now, the link between hand to hand combat and religious strivings grew much later. Specifically in the early Ming dynasty, so 14th and 15th century, and only came to fruition in the late Qing dynasty, in the 18th and 19th century. The fusion brought about the language we hear so often today when kung fu men and women describe the nature of their art. By this I am thinking of qigong breathing techniques, neijia inner strength martial practices, and the cultivation of cosmic qi energy. 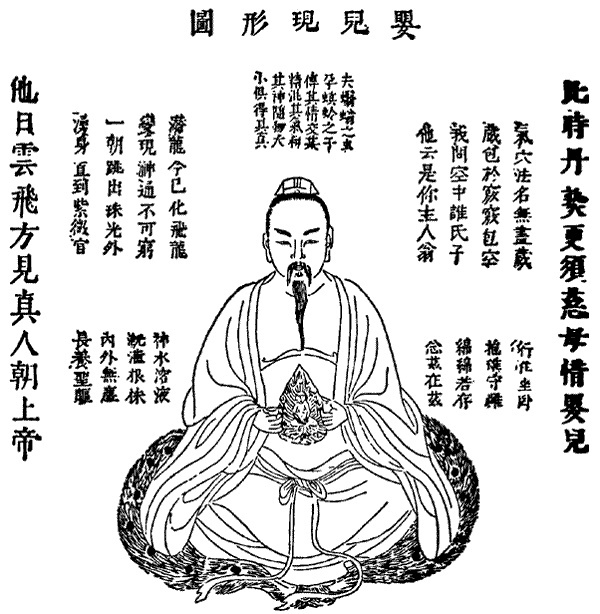 These ideas come out of the Taoist canon, which states that developing the qi is the first step towards immortality and transcendence of the corporal body. The cosmology wrapped up in the qigong practices is the taiji, or supreme ultimate, which splits into yin and yang, the male and female sources of power, which further separate into the five elements (wood, fire, water, earth, metal) and the eight trigrams. The idea is to bring the cosmos down to earth and cultivate the same cosmological truths within the body. Martial artists try to develop their own taiji through movements that mimic the trigrams and elements and through power structures that harness both the yin and the yang. Eventually the martial artist will be moving as one with the cosmos, walking the Way, and will have achieved true enlightenment and inner peace. Heady stuff. The Chinese kung fu masters have been pursuing this goal for centuries. Many a temple fair performer has made a fortune selling pills that provide a short cut to immortality, or crushing bricks with his qi power. The fiction realm is full of masters who float, levitate, effortlessly strike the cavities along the meridians through which qi energy flows, and generally perform magical and mystical acts due to their single-minded cultivation of the cosmological essence within martial arts. Does any of it hold water? That is a debate for the online forums and hard mats of the dojo. All I can say is that I have never seen anyone levitate and all men must die someday... but I see no harm in believing.